An attack by Taliban gunmen in north-west Pakistan that wounded a 14-year-old who campaigned for girls' rights has caused an outcry in the country. Malala Yousafzai was shot in the head on her way home from school in Mingora, the main town in the Swat Valley. The president and prime minister have led condemnation of the attack. Initial reports suggested she was out of danger, but there is growing concern over her condition with some reports saying she may need treatment abroad. Malala Yousafzai came to public attention in 2009 by writing a diary for BBC Urdu about life under Taliban militants who had taken control of the valley. Almost immediately afterwards, the attack was condemned by politicians and media personalities. The chilling attack on the young peace campaigner has been leading TV news bulletins here. Malala Yousafzai is one of the best-known schoolgirls in the country. Young as she is, she has dared to do what many others do not - publicly criticise the Taliban. Malala's confident, articulate campaign for girls' education has won her admirers - and recognition - at home and abroad. She has appeared on national and international television, and spoken of her dream of a future Pakistan where education would prevail. President Asif Ali Zardari said that Tuesday's attack would not shake Pakistan's resolve to fight Islamist militants or the government's determination to support women's education. He said that the aim of the "terrorists" who carried it out was to weaken the resolve of the nation - but the country would continue its fight against militants "until its logical conclusion". In a statement about the attack, Prime Minister Raja Pervez Ashraf said: "We have to fight the mindset that is involved in this. We have to condemn it... Malala is like my daughter, and yours too. If that mindset prevails, then whose daughter would be safe?" The attack has also been condemned by most of Pakistan's major political parties, TV celebrities and human rights groups including the Human Rights Commission of Pakistan (HRCP) and Amnesty International. HRCP senior official Kamila Hayat praised Malala Yousafzai for standing up to the militants and sending a message across the world that Pakistani girls had the courage to fight for their rights. But she also worried that Tuesday's shooting would prevent other parents from letting their children speak out against the Taliban. "This is an attack to silence courage through a bullet," Ms Hayat said. "These are the forces who want to take us to the dark ages." She was hit in the head and, some reports say, in the neck area by a second bullet. Another girl who was with her at the time was also injured. Doctors who treated her in Mingora initially said she was out of danger. 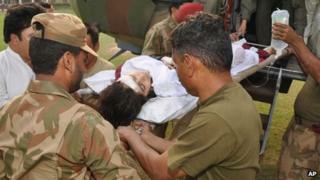 She has now been taken by helicopter to Peshawar for further treatment, officials say. One poignant entry said that her dream was a country where "education would prevail". The BBC's Orla Guerin in Islamabad says that Malala Yousafzai was a public figure who didn't shy away from risks and had strong support from her parents for her activism. Indeed, her father, who is a school teacher, expressed his pride in her campaigning. At that time some of us would go to school in plain clothes, not in school uniform, just to pretend we are not students, and we hid our books under our shawls.